Find your local Fall 2018 edition below and follow the links to read it online. OUR HOMES Barrie Fall 2018 // Fearless Renovation // Timber Frame Marvel // Home That Heals // Autumn Pleasures. OUR HOMES Grey & Bruce Counties Fall 2018 // Saugeen Fly-Fishing Retreat // Classic Historic Update // Family Reno Character // Bold Sofas. OUR HOMES Hamilton Fall 2018 // Retro Reno in the Woods // Duo's Designer Digs // Cosy Local Finds // Where to go Big. OUR HOMES London Fall 2018 // Countryside Modern // Classic Century Reno // Stylin' for Fall // Big Bold Sofas. OUR HOMES Muskoka Mid-Summer 2018 // 10th Anniversary! // Woodland Chic // Kennisis Encore // Manitouwabing Cottage. OUR HOMES Muskoka Fall 2018 // Legacy on Indian River // Return to Kushog // Lake Vernon Family // Huntsville's Bright Ideas. OUR HOMES Niagara Fall 2018 // Old Town Overhaul // Retiring in Style // Autumn Décor // 10 Ways to Go BIG. 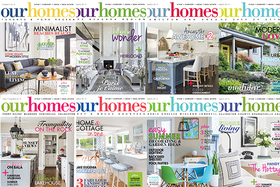 OUR HOMES Ottawa Fall 2018 // Equestrian Estate // Basement Beauty // 3 Model Homes // How-to Select Countertops. OUR HOMES Oakville Fall 2018 // Young Couple's Fixer Upper // Divine Transitional Design // Fabulous Forestvale // Sofas with Style. OUR HOMES Peterborough Mid-Summer 2018 // Whitevale's Rural Reno // Inspiration on Jack Lake // Hinterland Styling // Rub-a-Dub Tubs. 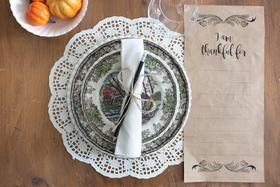 OUR HOMES Peterborough Fall-Holiday 2018 // Stoney Lake Canadiana // Makeover on the Menu // Local Experts // Tile Cornucopia. 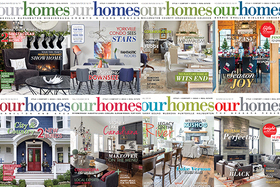 OUR HOMES Southern Georgian Bay Fall-Holiday 2018 // 7 Holiday Homes // Timeless Townhomes // Thornbury Past // Mark McEwan. OUR HOMES Toronto-York Fall 2018 // Atrium Addition // Making Bright White Feel Warm // Architect Inspired Reno // Creative Surfaces // Fireside Design. OUR HOMES Waterloo Fall 2018 // Cambridge Retreat Built on Love // 2nd Gen in Kitchener // Reno Help // Outdoor Fireplaces. OUR HOMES Wellington Fall 2018 // 2 Renos 2 Sisters // Hillside Craftsman // Autumn Décor // Pumpkin Soup. OUR HOMES Windsor Fall 2018 // Walkerville Attitude // Retiring Style // Get Hygge // Local Wood Artisan.